Ten years before the Battle of Little Big Horn, more famously known as Custer’s Last Stand, another group of US military servicemen were surrounded by Indians and wiped out to the last man. Known as the Fetterman Disaster, the story is worth repeating, because an O’Gara was among the victims. With the American Civil War over, joining the US Army must have seemed like a safe way to earn a steady paycheck. Michael O’Gara, a recent immigrant from Ireland to Chicago, enlisted to support his wife and two infant boys back in County Sligo. In April, 1866 he enlisted and soon found himself at Fort Philip Kearny in the Dakota Territory, now in the state of Wyoming. Private Michael O’Gara was assigned to Co. C, 2nd Battalion, 18th Infantry. Along with the 2nd US Cavalry, their job was to protect the fort and its occupants. The fort was deep in Indian country and the Indians were not happy about its construction on their land. Wood gathering parties, upon leaving the safety of the fort, were frequently attacked. During one of these attacks, on December 21, 1866, Captain William J. Fetterman was dispatched with eighty men to drive off the attackers. He was warned to remain within sight of the fort. Captain Fetterman was not a man lacking in confidence, he had been heard to claim, “with eighty men I can ride through the Sioux nation”. These words would prove to be ironic. Fetterman chased the small band of attackers into a clearing beyond view of the fort. Waiting for him were hundreds of Indian warriors (up to two thousand by some estimates). The battle was short and decisive. When it was over, Fetterman and his entire command were dead, including Private Michael O’Gara. The number of dead, seventy-six soldiers, three officers and two civilian frontiersmen, came to a total of eighty-one. The victims were buried in a mass grave at the fort, subsequently disinterred and reburied at the national cemetery at Little Big Horn Battlefield. 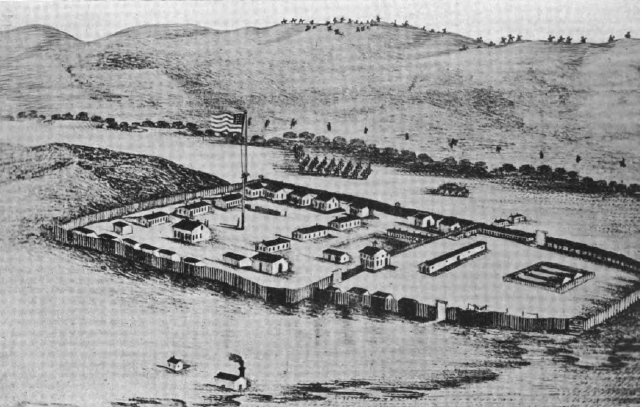 Fort Kearny, under constant siege by the Indians, was finally abandoned in July, 1868. It was later burned down by the Indians. Michael O’Gara’s wife and children subsequently emigrated to America and were awarded pensions. Walter J. O’Gara (1904-????) Oct. 1919 started working for Erie Railroad. II. Michael O’Gara (born 1 Sep 1864-1 Mar 1934) married Mary V. O’Hare (b. Oct. 1867-????) in the Bronx, NY on 13 Oct. 1898. Mary’s parents were James O’Hare and Mary Cashion. Thanks to Michael’s grandchildren, James R O’Gara and Claire O’Gara Grimes, for providing additional information. If you have additional information to share on this topic please add Comments. For corrections, please notify author. I am the daughter of Walter O’Gara, grandaughter of James. My sister and I are traveling out to the site in Wyoming in Sept. Thanks for the beautiful writeup! We are in contact with our cousin, Mary Irene’s daughter and with a little research can supply the dates of death of the three children of James and Mary. When we were children, we would occasionally get together with our “NY cousins”, but have long since lost contact. I would be delighted to share all my information with you, presuming we’re on the same page with the same family. So often the same names appear which makes it difficult to pinpoint the correct person. I look forward to hearing from you. I long to get a photo of Michael Senior from some Sligo source. I had never heard of Tir Na Nogara before! It is our understanding that Michael’s wife Bridget was on her way to America when the massacre occurred. So she arrived to find herself a widow. It apparently took approximately thirteen years of working in a NY garment factory for her to save enough money to send for her two boys. We have a great picture of Bridget, James, his wife Mary, and their three children early in the 1900’s. We also have a copy of the pension document issued to Bridget. My father James R. O’Gara ( b: Feb 20, 1901 NYC, d: Aug 6, 1974 ) was the eldest child of Michael O’Gara family. He married Sarah “Sally” Kennedy of Yonkers, NY. They had four children: Patricia ( b: Jun. 14, 1930 d: Mar. 18, 2007 ), Sally Michelle, Claire And myself, James Raymond the two surviving. and have two children – my sister will fill you in!!!!! I married Louise Finger from Farmingdale, LI. NY and had two children: James R. III, of Pound Ridge, NY and Kim L. of Spring Lake, NJ. Mr son James R. III married Pierangela Crocitto and they have two children, Michael James and Amelia. My father named his sister when he was a little one. He tried to say she was “a beauty” but it stuck with her into old age. She was known to me as “Aunt Booty” until I was twenty one and received a birthday wish from Aunt Isabelle and had to ask who that was!!!! I’m sure my sister Claire will add further history and comment. THREE OF MICHAEL AND MARY O’GARA’S CHILDREN: JAMES, MURIEL AND EDWIN WERE KNOWN RESPECTIVELY AS SONNY, BOOTY AND BUNNY WITHIN THE FAMILY. Ken Burns specials contain amazing detail on Fetterman and there is new info on Fetterman rebellion just published recently. I never heard the above story about 13 years before the boys emigrated. Timing is off according to my stats. I’m finding all of this information so interesting! I love being able to pass information down to my children about their ancestors. I’m married to Kevin O’Gara, who is George’s son and Walter’s grandson. Kevin and I have six children, 3 girls and 3 boys. I’m excited to have 3 sons who will carry on the great name, O’Gara! Did you fid the connection?